The Sheep Whisperer: Orca's Whale of a Tale! Let me introduce Ewe to my pearly whites! The enamel is quite convincing! 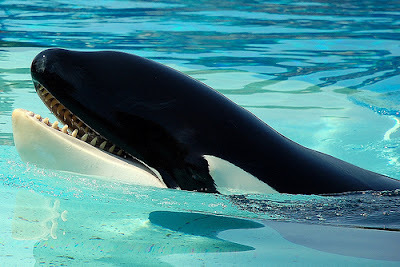 Killer Whales live in waters globally, but they clearly prefer cooler waters. 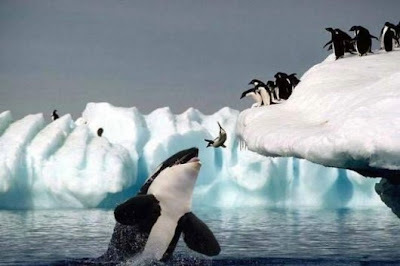 Approximately 50% or more of Orcas live in the Antarctica region. 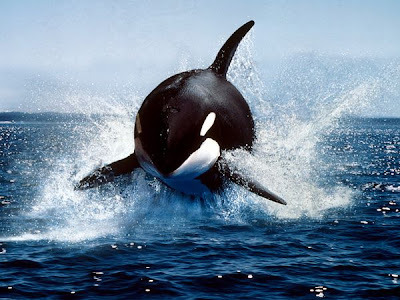 They are one of the fastest moving mammals in the sea, "clocked" at 30 knots at a normal pace. This speed assists them in hunting other prey, such as tuna, seal, penguin, salmon, herring, turtle, birds, squid, shark, rays, & walrus. 10,9,8,7,6,....3,2,1..Ready or not, here I come! Killer whales, are actually dolphins.They are the largest dolphins on record, reaching 30 or more feet in length, & weighing up to 12,000 lbs.! The largest male on record measured 32 ft. long , weighing over 20,000 lbs. Females are slightly smaller than males, measuring 16-23 ft. long & weighing about 6-8000 pounds.The largest female on record measured 28 ft. long, & weighing about 15,000 pounds. As Ewe can tell from my size, I shop in the "Plus" section! Killer Whales travel in groups, or pods, & work very well together as a community. When hunting together, besides using sonar or echolocation, they use a couple of unusual techniques to capture their prey. First, when encountering sharks, they hold the shark upside down, submerging it for about 15 minutes, until it suffocates & drowns. They also employ the technique of carousel feeding, in which they force herring into a tight ball by surrounding them with bursts of bubbles. They proceed to use their tail fluke to smack the ball, killing or stunning 10-15 fish at a time! Dinner is then served! "All-Ewe-Can-Eat" Buffets are my favorite restaurants! What a "Bird Brain" idea Ewe have, thinking Ewe can escape from me! 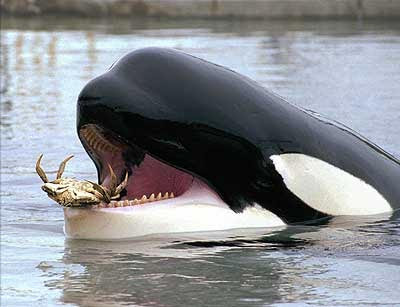 Killer whales are considered among the most intelligent of sea mammals. 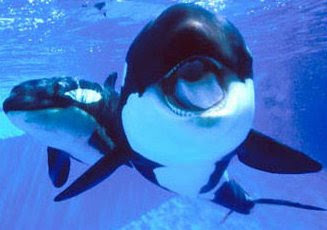 Orcas are highly social, & travel in groups of 5-30, called pods. Each pod has a female leader who makes sure the ill & the young are cared for & protected. She ensures the pod operates harmoniously as a family. Females also give birth to a 8 foot,400 lb. calf, after a 15-17 month pregnancy. The calf will nurse for up to 2 yrs., with a survival rate that is very low. 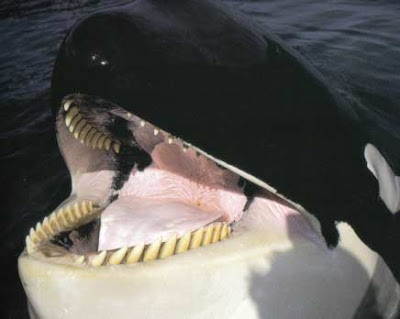 Adult Orcas in the wild live up to 90 years .They have a shorter life span in captivity. 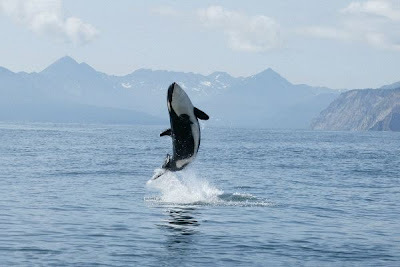 Killer whale calf is jumping for joy at the news he's going fishing! Can Ewe tell that I'm hungry? Sheep & Orcas both enjoy the safety afforded by moving in groups. By working together as a herd & pod, they are able to protect their young more effectively. Sheep receive additional help from their Shepherd! 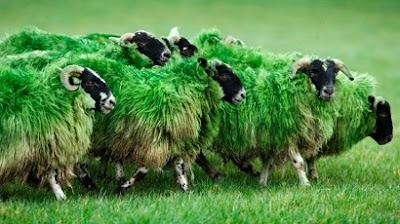 Do Ewe think Orcas are" green with envy" over our Shepherd? As Ewe begin a new day, thank God for the family He's placed Ewe in. Working together as a unit will pay rich dividends as Ewe allow the Shepherd to lead & guide!